As you may or may not recall, the Arcade Primer showed that the basic parts of an arcade system were fairly few and simple. All I needed to make this system run was a power supply, a display device, and some controls. Display Device: This was easy. I wired the five video signals (red, green, blue, sync and ground) into my custom pinout. 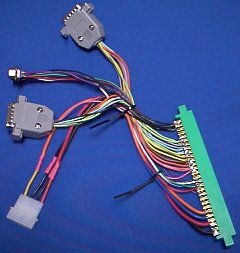 I planned on using an XRGB2 unit to display the game on a VGA monitor, and already had the cables ready for a 9-pin plug. JAMMA Harness: You'd think that this kind of part, necessary for almost all arcade games produced after 1988, would be common in Akihabara. No joy - I had to buy a wiring adaptor from MAK which included all of the wires I needed, and cut out the bits I didn't need. Power Supply: My trip to Akihabara proved that even the great Try Inc. couldn't supply me with parts - they had neither power supplies nor harnesses. I decided on a computer power supply; they were cheap, small, easily available and had the necessary voltages (five and twelve volts). Since no games I have use negative-five volts, I didn't bother hooking them up. Controls: I've found that NEO GEO controllers are versatile beasts, from slaying savage hoards to slicing bread. I ran the player controls to a NEO GEO controller port which allowed me to use any NEO controller. It may seem daunting, but there's surprisingly little to it once you've gotten the parts together and banged your head on them a few times. Simply connect the dots! If you'll have a look at a JAMMA harness you'll see the connections are clearly understandable. Connect, for example, the player 1 controls to the player one NEO connector. Start connects to Start, Right to Right, button 3 to NEO C button, etcetera.